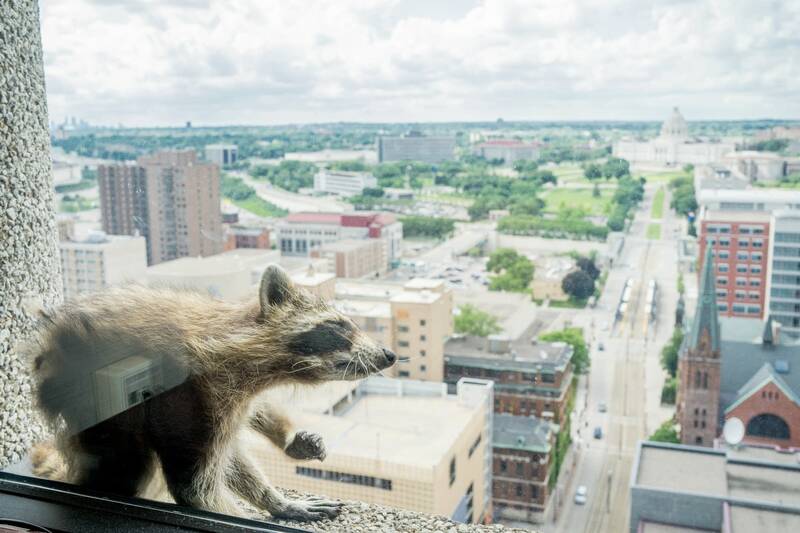 Experts differed on whether the raccoon that scaled a downtown St. Paul office tower Tuesday could — or should — be rescued from its precarious perch. 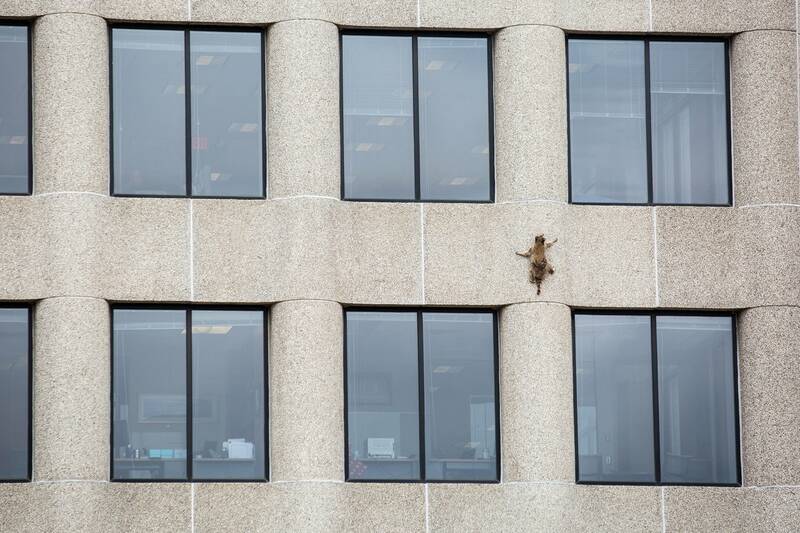 The mottled brown raccoon originally stranded on the office building's ledge on 7th Street, proceeded to escape to the roof of the two-story building, then climbed another 20 stories up the side of the nearby UBS tower, as people gathered on the street below taking photos, video and creating a buzz online. By late Tuesday, the critter had scampered up to the 23rd floor. Facebook and Twitter exploded with concern for the raccoon, with people from across the nation rooting for the animal's rescue. Animal control workers put live traps on the USB Tower roof with aromatic food, hoping the raccoon smelled it and could make its way to the roof, be captured and safely brought down to the ground. St. Paul firefighters also arrived at the Tower by mid-Tuesday and said there was nothing they could do, as it was too dangerous to attempt a rescue. And the windows do not open in the tower, workers there said. Wildlife experts said raccoons climb when they are in trouble or stressed and that is what likely happened when some workers built a makeshift ladder to try to rescue the raccoon. 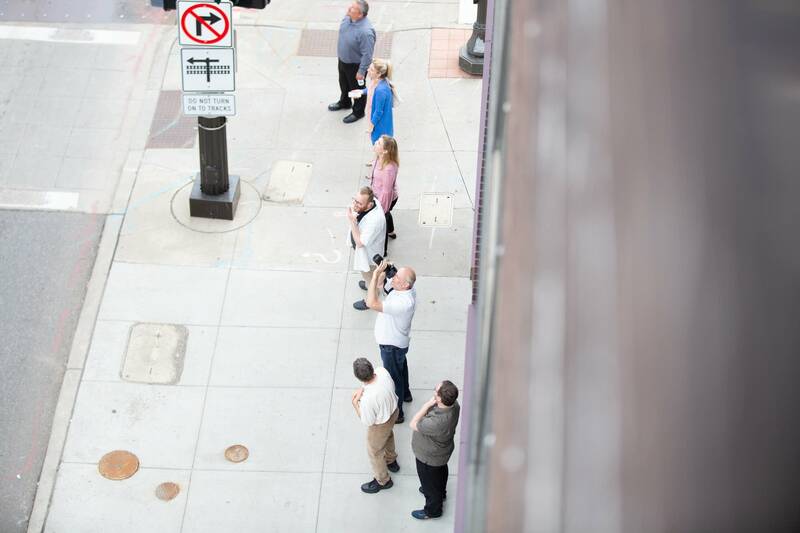 Instead, the animals started the ascent that had passersby stopping and pointing. But to Bill Dowd, climbing raccoons are nothing new. He's seen him on top of lampposts, cranes and up 10 stories. Dowd is president and CEO of Skedaddle Human Wildlife Control, a Canada-based company that removes wildlife safely from various places and spaces. The company does not have any branches in Minnesota, he said. "They get into the most unique and interesting places," said Dowd. "They certainly keep us hopping, that's for sure." 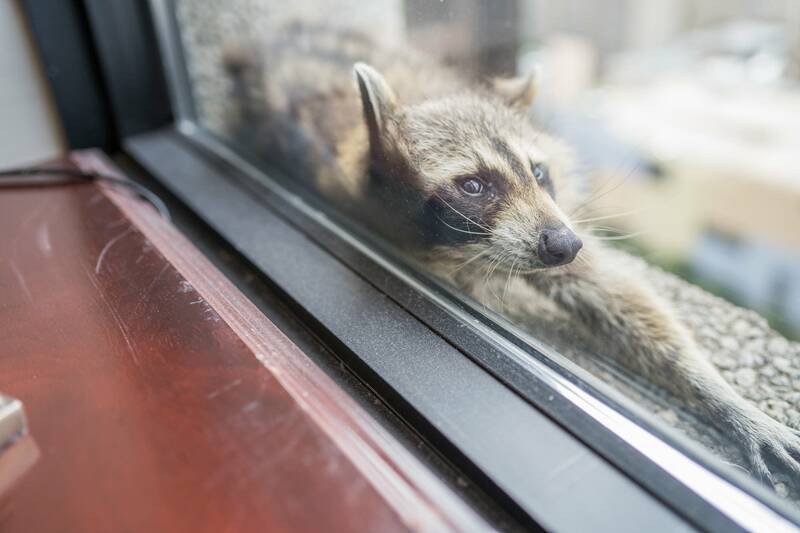 He said his company goes to about 100 to 200 calls a day rescuing animals, many of which are raccoons, from attics, chimneys and other places where they get stuck. "We've seen them anywhere and everywhere," he said. "But from a height perspective, we've had them clinging to the brick of a 10-story apartment building where we've gently coaxed them to climb down to safety. We've had them on construction cranes. "We wish we had a franchise in Minnesota to help out ... it would definitely be a fun and interesting job," he said. So how does Dowd's business "gently coax" them down? Getting above the raccoon and gently prodding them downward, Dowd said. But he quickly added: "It's a very skilled operation. What we don't want is that animal to jump because that would be terrible." What makes it even more tricky, he said, is that every raccoon is different: They each have their own personality and would react differently. Dowd said most urban wildlife can last about seven to 10 days without food or water. The raccoon called #mprraccoon on Twitter was first seen on a building ledge Monday morning, but it unknown how long it had been on the perch. Dowd added that if the raccoon is going to climb down it will happen during the night, as they are nocturnal animals. "When things are quiet and nobody's on the bottom the raccoon is going to say 'enough is enough,'" he said. "Its probably getting a little hungry and a little thirsty, so I would imagine in a day or two, or a couple quiet nights, its going to climb down by itself." As of 7:15 p.m. Tuesday, the raccoon remained on the ledge. And the internet was holding its breath and rooting for one lonely raccoon's safe descent.